We've made some exciting changes to the website. The new web pages have been rolled out to desktop, tablet and mobile, so you’ll get a more consistent experience. Our new home page is tailored to Personal customers. Business and Corporate pages can be accessed at the top of the site (or the menu top left of screen if you are using Mobile Banking). Logon button – clicking on the Logon button will trigger the drop down menu so you can select the section of the site you wish access. When you're browsing on Personal pages, the logon will default to Internet Banking (jumps to the top of the dropdown list) and similarly with Business Banking Online on Business web pages. 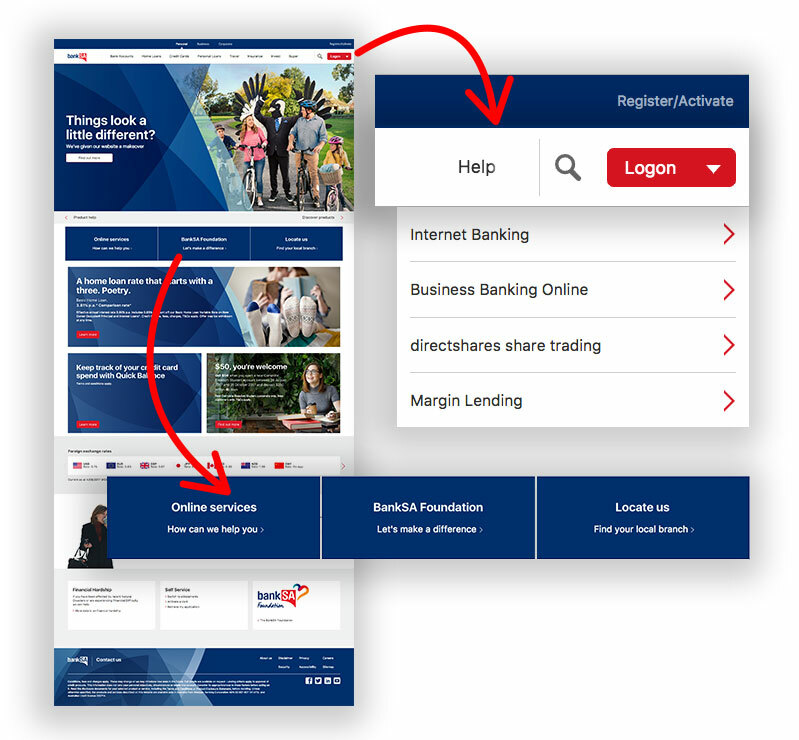 Help – can now be accessed via the menu at the top of the home page (or the menu top left of screen if you are using Mobile Banking). Online Services and Locate Us - moved from the top right of the site to lower down on the home page (scroll down if you are using Mobile Banking). Find Branch/ATM has been renamed Locate Us. We’ve redesigned the Personal section of the site to make it easy for you to discover information and make decisions about our products. Call us via Connect in Mobile Banking and skip the security questions or take a look at our FAQs. When will the new website be available? The new website will launch in September 2017. If the website has changed, how do I know that it is genuine? Do I need to upgrade my web browser? The new website is supported by modern browsers, therefore we recommend you upgrade your browser to ensure the best website experience. Note: If using Internet Explorer prior to version 11 the site may appear with limited functionality, however users should still be able to complete all tasks successfully. Which devices can I use to view the new website? The website is responsive and can be viewed using laptops and desktop computers, tablets (Apple and Android) and Mobiles (Apple, Android and Windows). Are there any changes to Internet Banking? No. Customers will still be able to access Internet Banking from the top right hand corner of our website. Your logon details will not change. Where do I find Pay to Mobile to collect my payment? The home page link to Pay to Mobile has been removed. Customers can collect a payment by entering ‘Pay to Mobile’ in search. Please note: all recipients of a Pay to Mobile payment receive an SMS that includes a link to the Pay to Mobile Collection Page. Where do I find Contact Us? Contact Us remains in the footer at the bottom of the home page. Where do I find About Us? About Us remains in the footer at the bottom of the home page.